The first rule of the Energy Futures Club is that there are no rules, but you can talk about it all you want. You would think that with power plants that last 60 or more years, and that take a decade to plan, site, and build, and with cars that last 20 years, and buildings that last 70 years, that planning for energy would be slow, deliberate, and and obvious. But in recent years the energy future has had a lot of public and political input, and unplanned accidents and technological breakthroughs. One unexpected thing was the recent economic setback and unemployment starting in 2008, that lowered greenhouse gases for industry and transportation. The recovery has been steady, but slower than expected. Coal has dropped from 50% of US electricity production to 38%. Plans for about 150 new coal plants have been scrapped. 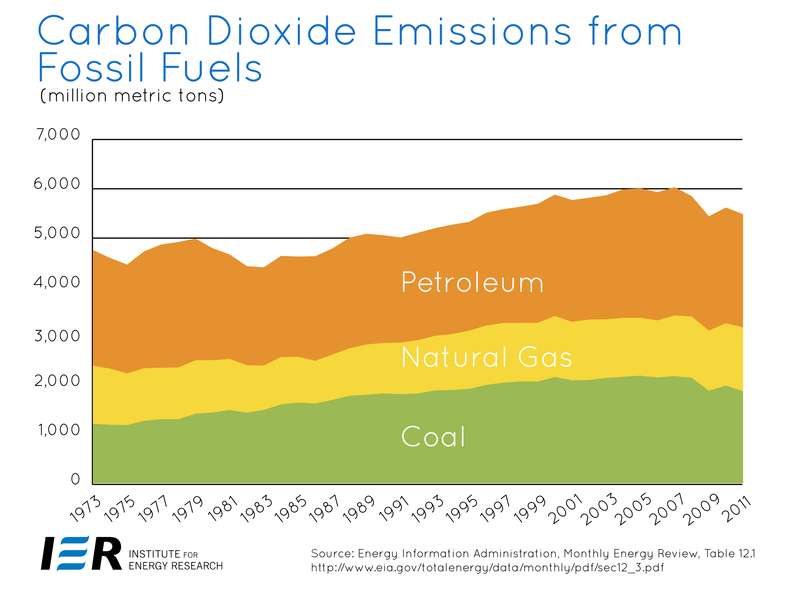 Partly, this is because natural gas is currently cheaper than coal. Also, there is increased cost for hauling coal by rail. Very old plants that would be too expensive to upgrade to modern emission standards are also being forced to close. Plant construction costs have also increased. The big bank that lends to coal companies has been pressured to end strip mining on mountain tops, since the tailings just get washed into valleys and rivers below. Finally, public opposition is occurring country wide. The recent dramatic smog in many Chinese cities and other large cities around the world will motivate removal of old polluting and inefficient coal plants. Even the US will benefit from replacing its old coal plants. New fossil fuel plants will have sulfate precipitators, double turbine cycles, and possible hot water and air conditioning uses. The health costs and losses in work time caused by particulate pollution can be an economic incentive for cleaner power. Particulates cause asthma, heart disease, and possibly lung cancer. The US presently is making cars with a 27 mpg average fuel efficiency. We are alone in this mpg efficiency, since every other country is measuring theirs in liters per kilometer. Inspired by California’s lead, the US is on course to 55 mpg in 2025. However, we still need our SUVs, so exceptions will be made to keep a proportional number on the road, and the actual average achieved will be about 43 mpg. CO2 production is of course proportional to the fuel used for a given number of miles, so for a 10,0000 mile year we currently burn 10,000 miles x 1 gallon/27 miles = 370 gallons. At 43 mpg, the 10,000 mile year will burn 10,000 x 1/43 = 233 gallons. This will be a reduction in 137 gallons out of 370 gallons, or a 37% reduction. At $4.00 a gallon, this amounts to a savings of about $550 a year. I hate to think of what the price in California will be with our increased population by that time. Oh wait, since they can soak us for the same amount for now only 233 gallons, the price will be the current spending of $4.00/gallon x 370 gallons = $1,480 for only 233 gallons in 2025, or $6.35 a gallon then. Who knew that the auto industry would be see the light and be willing to negotiate a favorable outcome, rather than just oppose the fuel economy increase? Oh wait, we bailed them out! Another factor is that autos take about 15 years until the entire fleet turns over. So it might be until 2040 until the full effect of the fuel economy effort takes place. 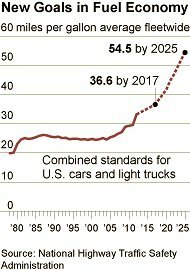 Still, the Obama administration is looking for new fuel economy goals to take effect after the 2025 goals. Ethanol from corn has been known from the start to be a tossup on whether they had much of savings from CO2 pollution. However, they have raised the price of corn, and caused food shortages. Laws requiring certain amounts of biofuels have caused forests to be cut down to grow corn or other biofuels. Subsidized ethanol from corn was, of course, greatly loved and backed by farmers. But is is not good for consumers, or people who rely on our exports of foods. It is time to end this abberation of efforts to slow climate change, both at the California and national levels. Car or van pooling to work is a great saver of money, pollution, and freeway congestion. Plus, you get to use the carpool lanes. My hope is that computer matching websites, and the social network propensity and friendliness of the younger generation will make greater use of this. In developing countries, many people are moving to the cities, and often into dense housing. Public transportation is very useful there. Vans or small buses are a major form of transportation in developing countries. Who knew that the fourth worst earthquake recorded, of a 9.0, would cause a 48 foot tsunami in March 2011, and would knock out power that would cause three reactor meltdowns in Fukushima Japan? (Actually, local geology professors had warned the company, but they had not acted on it.) Who knew that it was dangerous building the majority of Japan’s reactors on some of the world’s most dangerous subduction faults on the eastern side of Japan, which had built up the whole island by subduction and by volcanoes after the subduction released trapped water? Who knew that the population of Japan would react by wanting to shut down all 54 of their nuclear reactors that provided 30% of their electric power, and while there were plans to increase nuclear to 40% of their power? Who knew that many in the rest of the world would also want their reactors shut down? A less drastic approach would be to protect or shut just the East coast Japanese reactors, but keep active the West coast reactors that are not on such faults. Who knows what will prevail there? Who knew that new earthquake faults would be found near the San Onofre plant, and the Diablo Canyon plant in California? Who knew that San Onofre would goof the replacement of its heat exchangers at $671 million, leaving the plant with at best one reactor operating at 2/3 power? Who knew that the best landslide and earthquake fault surveying ordered for such plants would involve large sonar shocks in offshore waters every 15 minutes for weeks in local sea mammal populated areas? So we see that two years ago some were planning for a resurgence of almost CO2 free nuclear power plants with a new set of Westinghouse AP1000 accident proof reactors. There seems little reason not to proceed with them in areas that are free of earthquakes and floods, and not near population centers. Their cost estimates are relatively low, since they are standard reactors and will be pre-approved, along with some government guarantees for the first few. Previous reactors, however, have far overshot their cost estimates. With the latest analyses of Radiative Forcings of 2.8 W/m², CO2 is about 1.7, but methane is about 1.0, and black carbon is about 1.1, though with large errors. Clearly both of these will have to be seriously dealt with, with further mitigation efforts. Black carbon causing health problems will have to dealt with by adaptation methods as well. With the reduction in pollution of sulfates from coal burning and particulates, some of the cooling aerosols will be removed, but also greenhouse gasses, which will somewhat even out. Except for central Africa, most countries are approaching a fertility rate of two children per woman, which will level off the country’s population. The projections for 2100 have a wide range, but the center of the range levels the world’s population off at about 11 billion. In terms of greenhouse gas pollution, central Africa needs to replace biofuel burning with kerosene for cooking and light. They can also use solar stoves, and small solar power lights. The nation, states, and cities have military, economic, social, education, and infrastructure problems to deal with that are very costly and need attention in the short term. The projections of global warming effects look like they can be put off until 2050 or 2100, or can be dealt with on the scale of 50 years when fossil fuel plants or buildings need to be replaced. Of course the greenhouse gases are active now in increasing climate forcing. They may be contributing to drought that is depleting ground water reserves, killing off livestock, bankrupting farmers, and ruining the soil. They may be enhancing storms and changing their paths into previously secure areas. The costs for reconstruction take away money that could be used for mitigation, adaptation, or other purposes. Every bit of CO2 put into the atmosphere or ocean now will last on the order of a hundred years, and can’t be cleaned up later in the century, when we realize how much more of a problem we have. Every billion dollars spent on the wrong kind of power plant or building now will cause more pollution for its lifetime. Every construction in a vulnerable area will have to be replaced or taken as a loss later. We need to consider climate change and its effects now in all of our planning and allocation of funds. My approach here has been to focus on the areas where major progress in decreasing emissions can be made. The concept of low hanging fruit, or things that can be changed immediately by behavior changes, or at the smallest cost per unit of emission are the first place to start. In practice, economics, politics, and public attitudes toward various sources of energy and conservation have been guiding changes. Sometimes these have lowered emissions, and sometimes not. Clearly, the problems of informing the public of the science involved in climate change, and of removing the politicization of the problem of climate change, will be major challenges. This entry was posted in Autos, Climate Change, Conservation, Earthquakes, Electric Power, Natural Gas, Nuclear Energy, San Onofre, Solar Energy, Transportation, Tsunami, Wind Energy. Bookmark the permalink.